As part of a research university, the USC Spatial Sciences Institute is incredibly helpful in finding opportunities for students who want to pursue research. My first research experience was the summer after sophomore year through a USC Dornsife Problems Without Passports (PWP) course offered for GeoDesign students where we travel to Amsterdam and partake in a real world case study using GIS. SSI ensures that students are informed about the opportunities through its student newsletter and make sure that resources for USC funding are well known, as I was able to apply for a SURF (Summer Undergraduate Research Fund) grant to help cover the costs of the PWP. This course/research experience really let me put my foot in the door regarding research with SSI. At the end of the summer, I received an email from Ken Watson with information about all of the research projects that would begin in the fall as my junior year began. I excitedly applied and was placed on a research team under Beau MacDonald analyzing crime trends in Los Angeles in a partnership with the Los Angeles Mayor’s Office. This project was born from a partnership of Jack Dangermond from Esri, the Spatial Sciences Institute, the Los Angeles Mayor’s office, and the Los Angeles Police Department with the goals of identifying and evaluating crime data to configure a prototype dashboard to facilitate ongoing spatial analysis of crime occurrence in Los Angeles. This work is intended to support the ability of the Mayor, other city leaders, and other stakeholders to better understand spatiotemporal patterns in crime occurrence, thus supporting the ability to better deploy city resources and make policy changes that improve public safety. While it capitalizes on the spatial science skills for visualization of data and maps, the framework of problem solving is also touched upon to arrive at a solution. Highlights from research include giving a presentation to members of the mayor’s council, creating a web mapping application through ArcGIS Online, writing a technical report for the city, and creating a research poster for the USC Undergraduate Research Symposium. 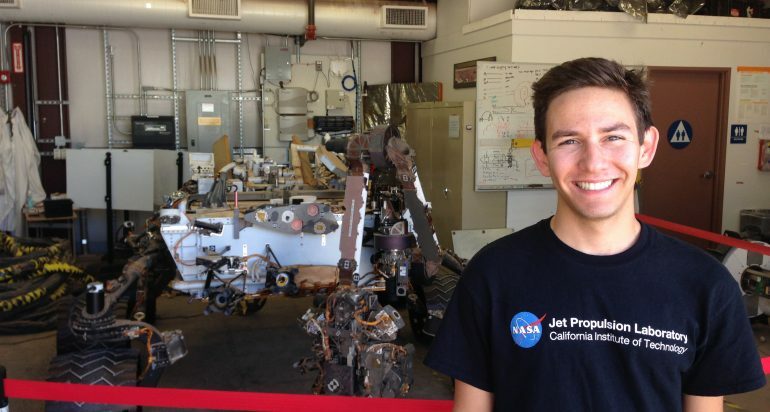 After speaking with staff and faculty within SSI, I was encouraged to apply for a potential partnership for summer research with the NASA Jet Propulsion Laboratory. In 2009 a project called UAVSAR became operational to measure deformation of the Earth’s surface. UAVSAR is an airborne radar instrument flown to measure tectonic deformation and surface motions. This program supports the deployment of data and information systems and services that enable the freer movement of data and information within a distributed environment of providers and users, and the exploitation of needed tools and services to aid in measurable improvements of Earth science data access and data usability. The primary objective of GeoGateway is to enhance, extend, and improve existing components of NASA’s distributed and heterogeneous data and information systems infrastructure. I researched and analyzed UAVSAR observations in the GeoGateway interface (http://geo-gateway.org) for motion associated with landfills and created a database of information while providing insight to accessibility and user experience of the software. Working under Dr. Andrea Donnellan, I quantified the amount of line of sight change over different time periods and converted results to vertical estimates of compaction. A published technical report is expected to come out of the research. During the summer after my internship with JPL ended, I once again received an email posting from Ken about research opportunities within SSI open during my senior year. After ranking my research interests and submitting my resume and application, I was placed under Beau MacDonald once more, this time on researching a storm water conservation solution that would support Mayor Garcetti’s Sustainability pLAn. This project was born from a partnership of Jack Dangermond from Esri, USC, the Los Angeles Mayor’s office, and the Los Angeles Sustainability Team with the goals of identifying and evaluating stormwater data to configure a web mapping application to facilitate ongoing spatial analysis of water infrastructure in Los Angeles. To better serve the people of Los Angeles, the partnership offers an innovative new lens to understand stormwater capture within the context of the city while providing an example of a public-private partnership that mirrors the pace of City Hall and brings the talents and skills of academic staff and students to timely and urgent city challenges. Highlights from this research include concentrating on defining and communicating the holistic benefits of storm water capture, as social/public aspects which will be incorporated in the app, and presenting this research at the 2018 Geospatial Summit and 2018 URISA CalGIS Conference as a Lightning Talk. This research won first prize from the Arnold Schwarzenegger Sustainability Institute at the 2018 USC Undergraduate Research Symposium. At the beginning of my senior year, I was told that SSI hired another faculty member, Dr. Andrew Marx. He specializes in Unmanned Aerial Vehicle GIS data, which is similar to what I worked with during my time at NASA JPL. I sent him an email to meet with him during office hours to discuss what he’s worked on and gain insight from him. He reached out to me that fall about potentially researching the use of satellite imagery in humanitarian relief. I then also started researching under Dr. Marx in January of my senior year and am continuing research under him as a graduate student in the M.S. GIST Program. This research project works to improve and expand the uses of satellite imagery to detect and document human rights violations such as war crimes, crimes against humanity and genocide by leveraging recent developments in computer vision, time-series analysis and CyberGIS. Under Dr. Andrew Marx, my role as research assistant will be to identify and preprocess large stacks of satellite imagery, co-author the manuscript and assist in the resulting statistical analysis. While the work is largely computational, the aim to provide evidence to prosecute war criminals and alleviate suffering in the darkest corners of the Earth. Research project goals are to develop, validate and pilot the use of smallsat technology in the first human security monitoring system that can be used by human rights organizations, NGOs and other entities seeking to corroborate on-the-ground testimonies of incidences of destruction and genocide. During the spring semester of my senior year, Ken sent out an email for a summer internship with the City of LA. Having researched on joint-partnerships with the Mayor’s Office the past two years, I decided to apply. I was selected as an intern for the Mayor’s Summer Data Academy and placed with Los Angeles Sanitation as a member of the Solid Resources Customer Care Division Data Team. I continued to work with the department full-time as a student worker after the summer was over and have recently been employed full-time as a Project Assistant focusing on integration of GIS products and services relating to solid resources management. While the opportunities for student research are plenty, it is important to establish yourself as a hardworking student willing to take imitative in order to succeed and truly learn from the process. I am very grateful to the Spatial Sciences Institute and USC Dornsife for providing me with countless opportunities to further myself through academic research. My research in Amsterdam through Dornsife’s SURF Program taught me to compare how GIS is viewed in a global context through both theoretical and practical lenses. A research partnership with NASA JPL gave me insight into how to scientifically work to advance understandings of the natural world while experiencing the sense of working for a globally influential organization. In addition, the LA GeoHub Project was invaluable as a hands-on collaborative learning experience and instilled a passion for community-based research while allowing me to advance my technical and communication skills by presenting to members of the mayor’s council, creating public facing web mapping applications, and writing a technical report for the city. Finally, my current research is on a project that utilizes satellite imagery to provide spatiotemporal evidence of the Rohingya genocide and human rights abuses to the International Crime Court. I am proud of my work’s positive global and human impact, especially in attaining amnesty for refugees. USC has fostered my communication skills, curiosity, and work ethic to make me not only a distinguished representative of the university, but also a good citizen.